The Miroir! Miroir! 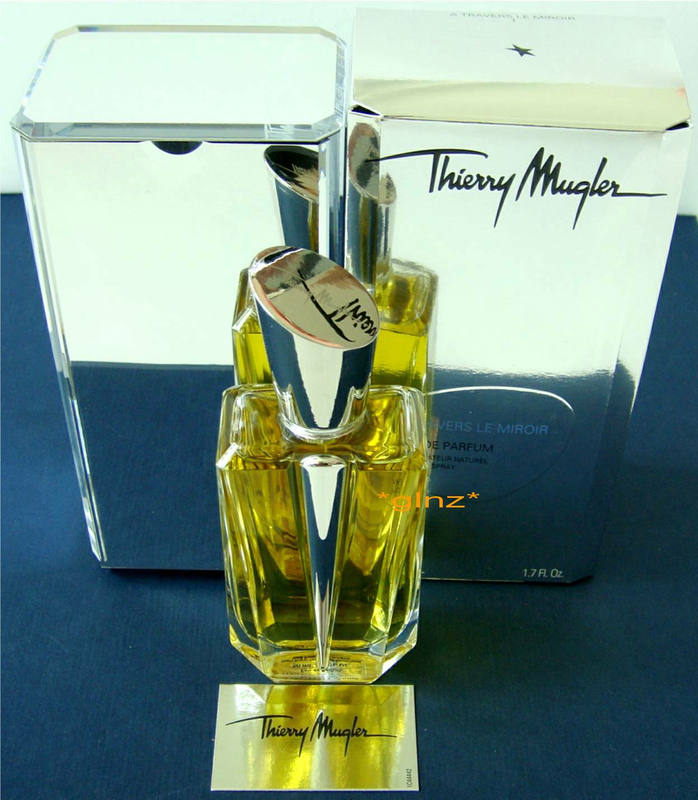 By Thierry Mugler collection includes five fragrances, each of which embodies a fluid paradox and is named after mirrors that reflect the contradicting facets of the wearer’s personality. packaged in exquisite Art Deco-inspired transparent crystal bottles, the sleek lines subtly highlight the delicately tinted fragrances while the gleaming metal cap echoes the mirrors of the box that contain them. The persona of each perfume is unique and encourages a different thought. Thought: Embrace your duality. This fragrance, named after the fabled Alice in Wonderland mirror, accentuates feminine strengths and masculine fragility. A paradox is created as the most feminine of flowers, the tuberose, settles at the heart of a very masculine, woody accord which includes the accents of absinthe, and the minty freshness of wintergreen. Thought: Embrace your naturalness. A fragrance with the aura and allure of youth: simple, airy, and yet sophisticated. Its natural aldehyde (used for the very first time in perfumery) gives a radiance and vibrancy to the bittersweet accord of patchouli and musk. The perfume has a strong metallic aura. Thought: Embrace your femininity. Remember the mirror in Snow White? The many facets of womanhood come to life in this tantalizing trinity – lily for virgin, orange blossom for the young bride and milky notes for the mother. Thought: Embrace your darker side. Linked closely to the make-up line, this perfume is an unpredictable contrast of light and dark, the bright side of this perfume flickers with the effervescence of citrus accords, while the shadowy deeper side brings in the wildly exciting bitterness of cinchona bark and vetiver, heightened by the black intensity of liquorice. Thought: Embrace your sensuality. Imagine a fragrance that could become obsessively addictive – this one contrasts the unusual notes of toast and sun-warmed skin with jasmine note. Drench yourself in these carnal, gourmand notes to discover how divinely delicious you can be. Unlike some others, these perfumes are not time or budget bound creations. In the spirit of true luxury, they are worked on till they perfectly embody the exact emotion Mugler wants to evoke in the wearer. A lesser-known fact is that Mugler rarely makes technical contributions to the “designs” of his perfumes – he talks to his team only in terms of emotions and his references are experimental and ephemeral. Each perfume has its own story of mystery. Mass consumer tests are not carried out – Mugler doesn’t believe in creating what people like, but what people could like. The perfumes are architectural in essence, built around frames and combining fashion with fragrance. Often avant-garde, they use novel and unusual raw materials and processes. No wonder each of the Mugler perfumes – the iconic Angel, Alien, Ice Man, Eau de Star and Innocent Secrets, to name a few have come to be ‘inspirations’ for other perfume brands.